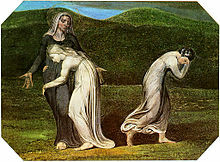 The Biblical Naomi entreating her daughters-in-law Ruth and Orpah in this image by William Blake based on the Book of Ruth. Ruth (Hebrew: רות‎ rut, IPA: [ʁut]) is a common female given name noted from Ruth the eponymous heroine of the eighth book of the Old Testament. Ruth first occurs as a given name in Europe and the British Isles at the time of the Reformation prior to which the occurrence of Biblical names – unless borne by saints – was unusual. Although Puritans generally disfavored Biblical proper names they seemingly made an exception for Ruth as it could be interpreted as a virtue name via equation with ruth a then-common noun (Germanic in origin) which overall meant sorrow but which could be interpreted as compassion: Ruth therefore was brought by the Pilgrims to English-speaking North America where overall the name has been more popular than in the British Isles, although the name Ruth has been markedly more popular in Ireland than in the United Kingdom. Ranked at #46 on the 1890 tally of the most popular names for American newborn girls, the name Ruth showed a sharp increase in popularity on the respective 1891 tally with a ranking at #19 while the tallies for the years 1892 and 1893 ranked the popularity of the name Ruth at respectively #5 and #3. The impetus for the boost in the popularity of the name Ruth was the 3 October 1891 birth of Ruth Cleveland daughter of (then former) US president Grover Cleveland and his wife Frances Cleveland, the latter herself a celebrity due to her 2 June 1886 marriage – she remains the youngest First Lady and the only one wed at the White House – after which she'd proven a very popular First Lady. Although Grover Cleveland lost the 1888 presidential election to Benjamin Harrison the victor proved very unpopular, and by 1891 the American public overwhelmingly regarded the return to Presidential office of Grover Cleveland – and therefore Frances' return as First Lady – as being inevitable (Grover Cleveland was indeed re-elected president in an 1892 landslide victory). The birth of the Clevelands' first child Ruth therefore ranked as front-page news, with press mentions of "Baby Ruth" occurring regularly throughout Ruth Cleveland's infancy and toddler period. The name Ruth retained a Top Ten ranking in the yearly tallies of the most popular names for American newborn girls until after 1930, remaining in the Top 20 until after 1937 and in the Top 50 until after 1950. Typically for traditional one-syllable girls names, the popularity of the name Ruth for American newborns has decreased since the mid-20th century with the name last ranking in the Top 100 in 1961, being then at #96. The tally of most popular names for newborn American girls for the year 2014 ranks the name Ruth at #314. ^ Isaac Slobin, Dan. The Crosslinguistic Study of Language Acquisition. p. 342. ^ a b "Ruth". Behind the Name. Retrieved 15 April 2016. ^ Cobham Brewer, Ebenezer (1997). Adrian Room, ed. Brewer's Dictionary of Names. Abingdon OXON: Helicon Publishing Ltd. ISBN 978-1859862322. ^ Algeo, Matthew (2011). The President Is a Sick Man: wherein the supposedly virtuous Grover Cleveland survives a secret surgery at sea and vilifies the courageous newspaperman who dared expose the truth. Chicago: Chicago Review Press. pp. 50, 172. ISBN 978-1-56976-350-6. This page was last edited on 5 April 2019, at 12:32 (UTC).